Having written something similar professionally in the past, I gotta admit I'm a sucker for this kind of game. I could spend hours on it! Very well made and congrats on the theme. I would love to see a bit more build-up to combos and difficulty as seen in older Popcap games and score during the game next! Great job for one month's work. Great game! I like the graphics and sounds. 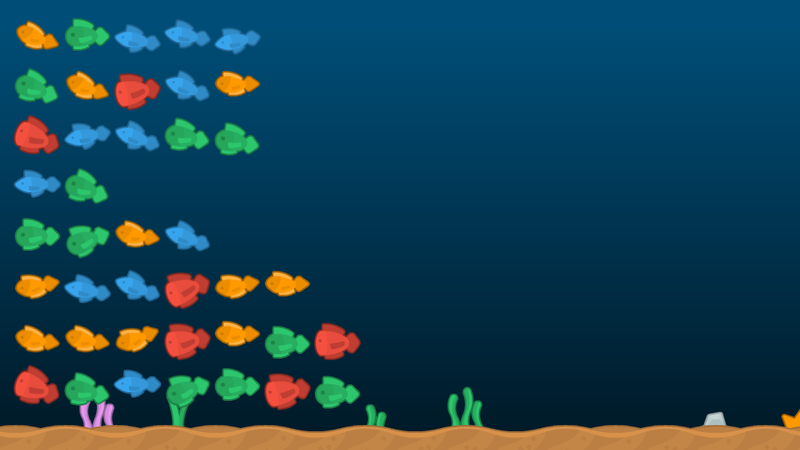 One feature I would like to see is to give the player a way to advance the next column of fish manually. 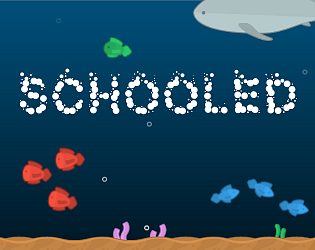 At the lower levels, I felt there was a bit too much downtime when I had no more moves and was waiting for more fish to appear. Fun game I like the audio! My only complaint is that it seems like the best tactic is to spam click as much as possible - though maybe I just don't understand the clicker genre! Overall a nice complete project. I honestly haven't done enough testing on this part of it but the two approaches are to spam click in order to try to survive longer or let the fish build up to try to match a larger group which gets you more points. I'm not sure which is the better tactic but I usually go for bigger groups in the beginning when the new fish arrive more slowly and then rapid click once it gets too fast. Got 1050. Fun little game! Could easily see some more mechanics and stuff thrown in to spice it up! Thanks. Since this was primarily done as part of One Game A Month I did trim some some features in order to complete it in a month. Simple, intuitive and enjoyable. I'm surprised if this game isn't on stores. That is an amazing compliment. I'm actually just getting started making games so I'm more focused on fully finishing little projects. Once I have a few more projects I may take one and try expanding it into something more robust. This is a solid game. I would move the explanation on ? to automatically appear in the beginning. Or alternatively find another way to show how the game is played. I loved that you used a blow fish to blow things up. That way it was clear to me right away what it's for :). I also like how you designed the Game Over and Menu part. That's something may jam games forget about. Thanks for the comments. If I ever put out another version I'll look into making the instructions more prominent. The title screen/menu and game over are parts I really tried to focus on for this game. I usually put in something bare bones. Very nice. I was honestly a bit confused as to what to do at the start, but I figured it out. A small tutorial would help this game, but it was very fun. Thanks, since it's come up twice I'll definitely look into providing more instructions up front in any future versions.